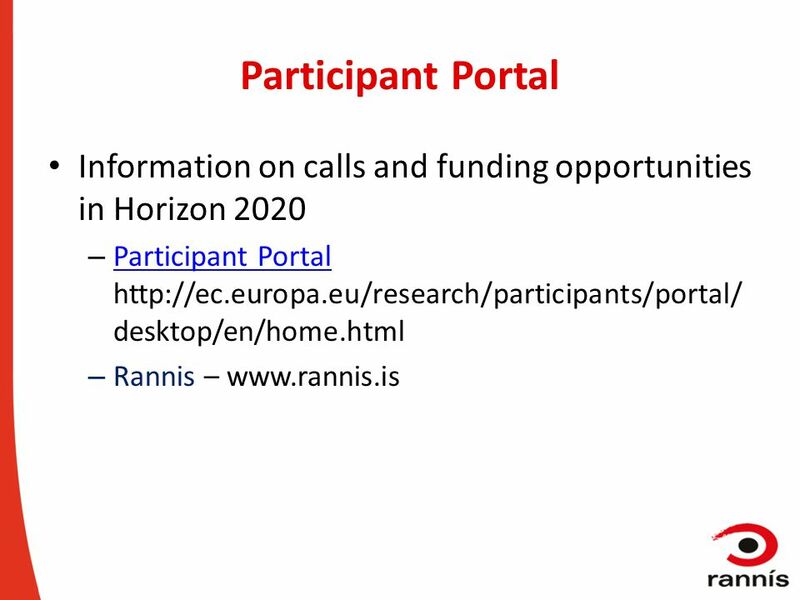 European cooperation programmes 2014-2020; opportunities for local and regional authorities Rannis Elisabet M Andresdottir. 14 Transport MG.5.4-2015. 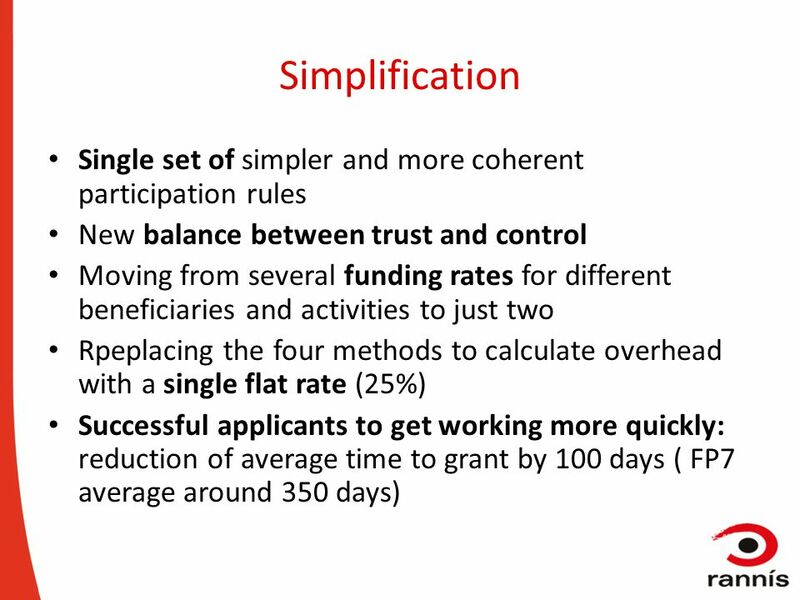 Strengthening the knowledge and capacities of local authorities Specific challenge: Achieving sustainable urban mobility requires the adoption of new strategic planning approaches at the local level. However, very few authorities undertake a sound analysis of trends, develop scenarios and provide the necessary long term policies and focus. Without strengthening of authorities' knowledge and capacities, a transformation of urban mobility planning will not be achieved. 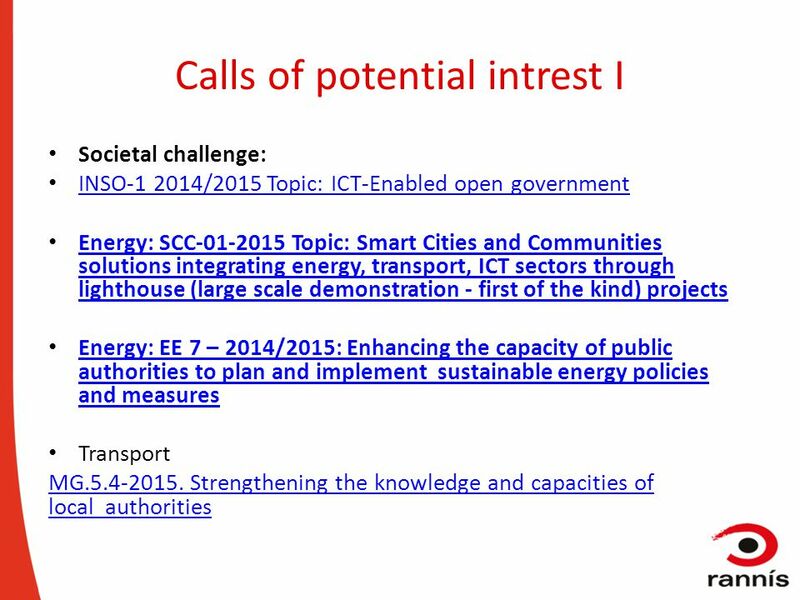 Scope: Proposals should address one of the following domains: Promoting take up of the innovative concept of Sustainable Urban Mobility Plans (SUMPs). 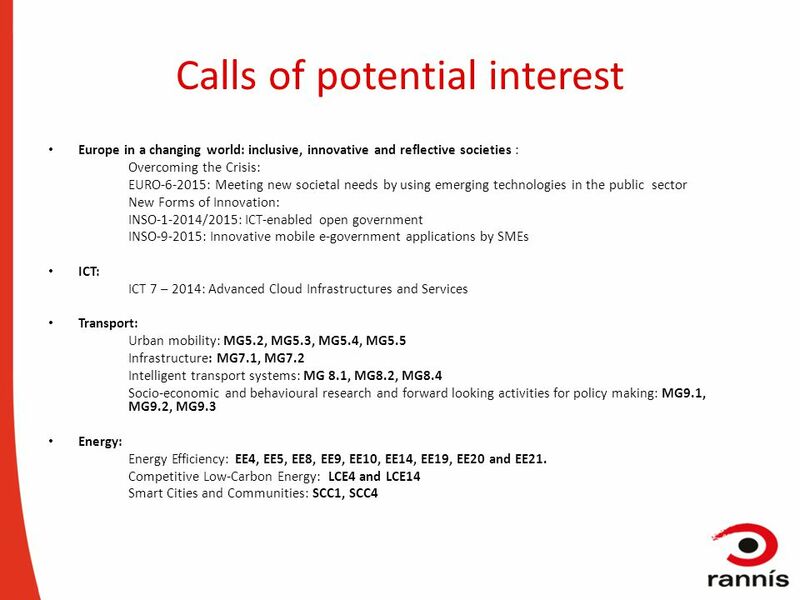 Proposals from large networked groups of local authorities should include instruments and mechanisms for information exchange to assist them in preparing and implementing SUMPs. 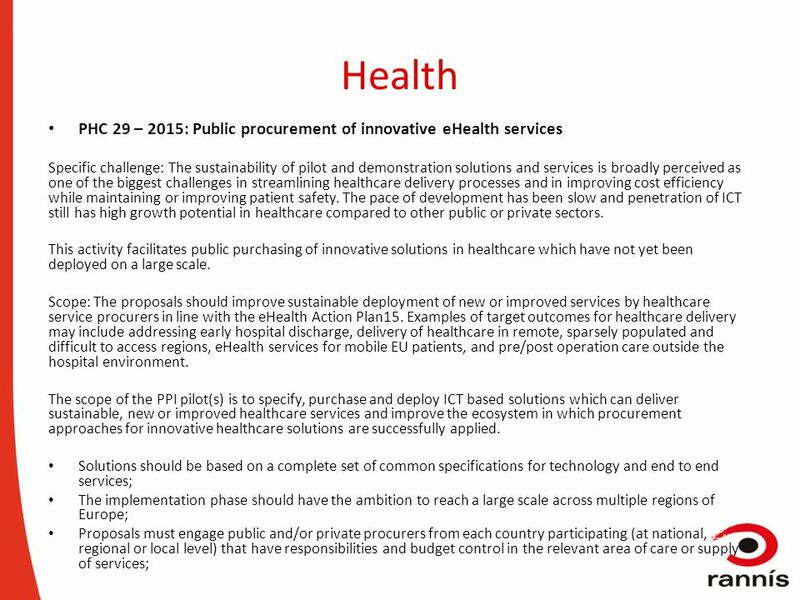 The plans should build on a solid methodology13 and include quantified targets. 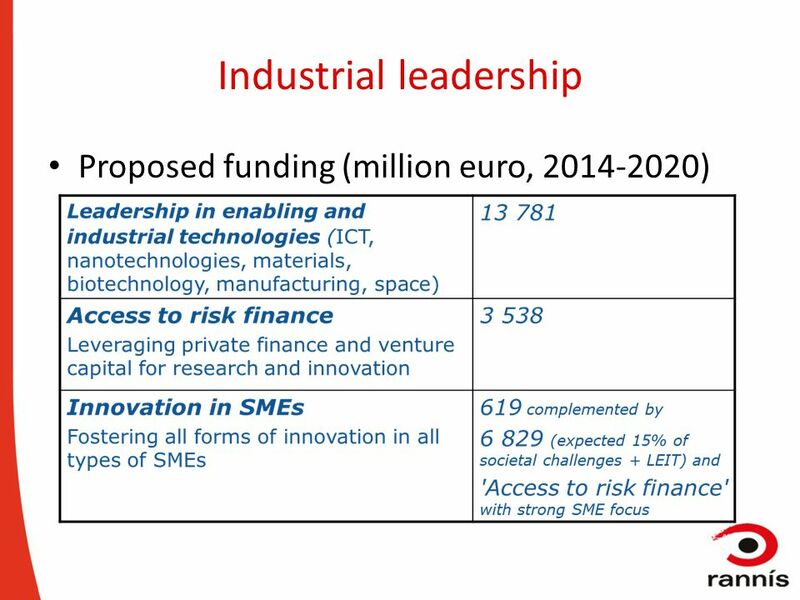 Proposals should ensure that the plans comprise a long-term vision, build on local consultation and interdepartmental coordination, include monitoring and evaluation, address financing options, and consider a wide range of measures, including newly-emerging technologies, policy-based, and soft measures. Enhancing the capacities of local authorities and other stakeholders to successfully plan and implement innovative sustainable mobility measures, technologies and tools, on the basis of reliable data and analysis. Sustainable financing should play a key role, which means that special attention should be given to setting up business cases, innovative procurement, the development of bankable projects and partnerships. 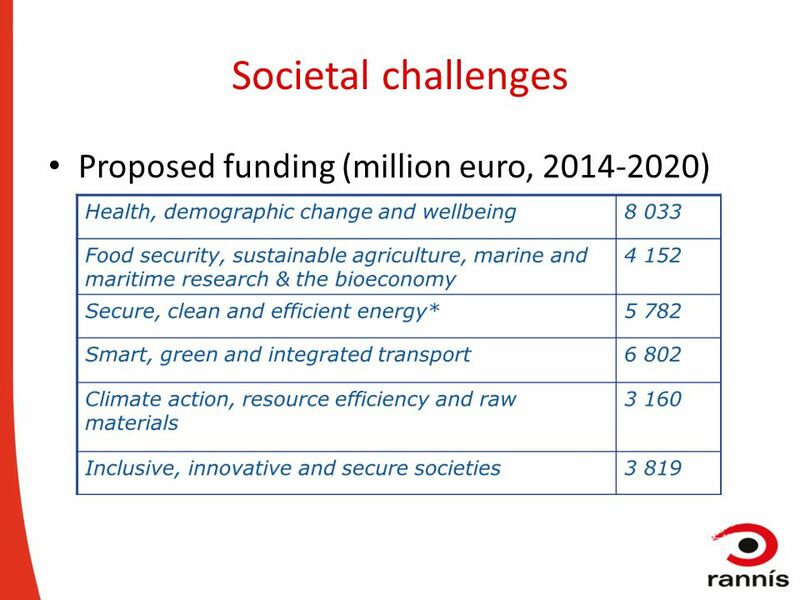 The Commission considers that proposals requesting a contribution from the EU of between EUR 2 to 4 million each would allow this specific challenge to be addressed appropriately. 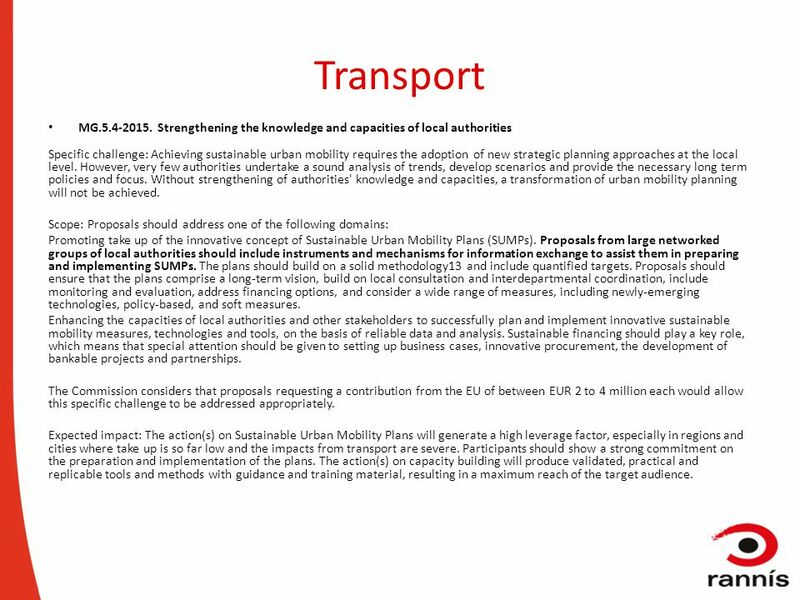 Expected impact: The action(s) on Sustainable Urban Mobility Plans will generate a high leverage factor, especially in regions and cities where take up is so far low and the impacts from transport are severe. 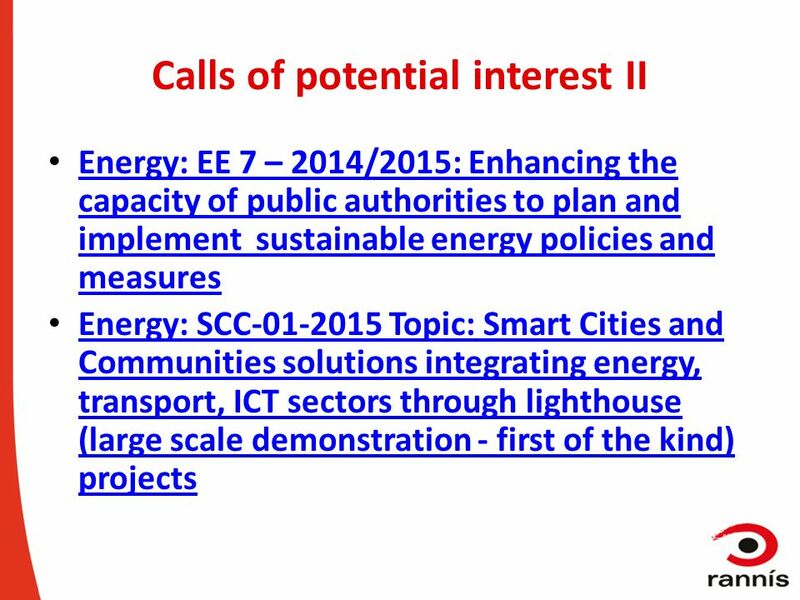 Participants should show a strong commitment on the preparation and implementation of the plans. 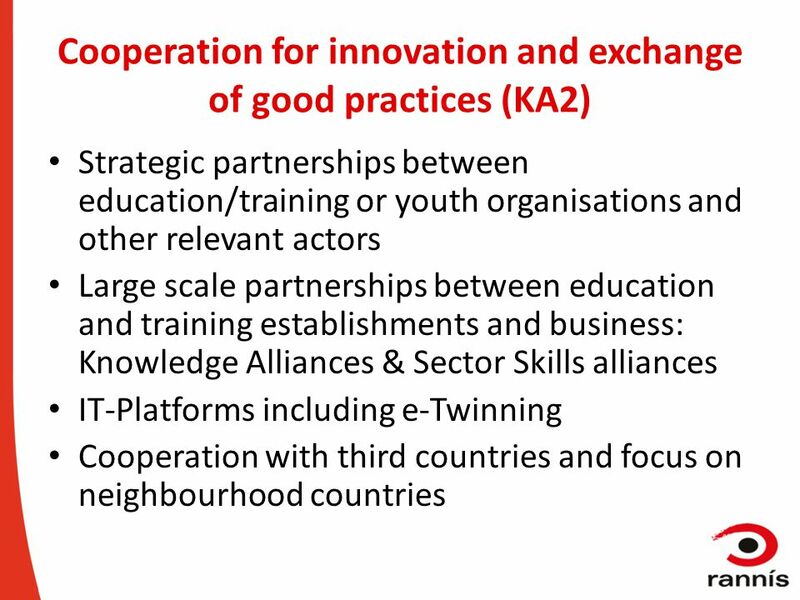 The action(s) on capacity building will produce validated, practical and replicable tools and methods with guidance and training material, resulting in a maximum reach of the target audience. 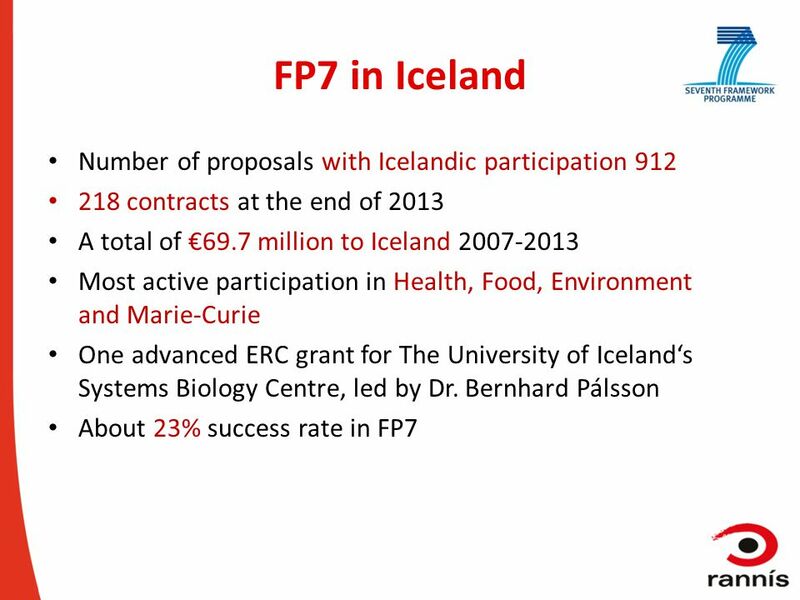 16 Public Demand Driven Innovation PCP and PPI in Horizon 2020 Pre-commercial procurement in the field of scientific instrumentation (PCP) – Proposals will define requirements and terms of reference for common procurement of scientific instrumentation and organize joint PCP action encouraging research, development and validation of breakthrough solutions that can bring radical scientific and efficiency improvements in research infrastructures services. 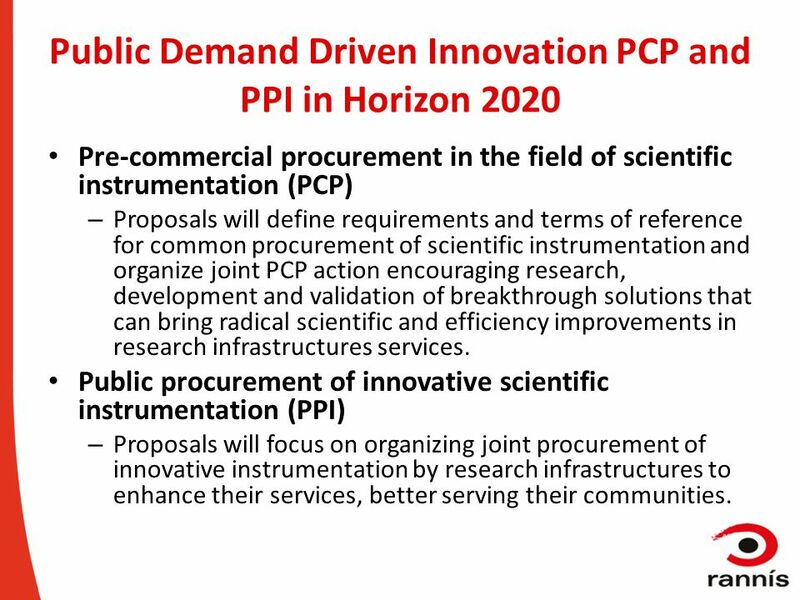 Public procurement of innovative scientific instrumentation (PPI) – Proposals will focus on organizing joint procurement of innovative instrumentation by research infrastructures to enhance their services, better serving their communities. 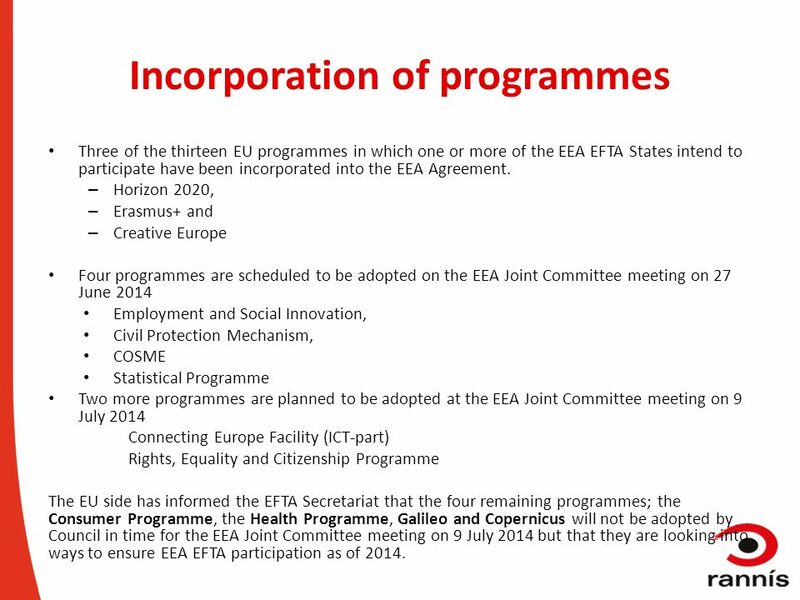 22 Incorporation of programmes Three of the thirteen EU programmes in which one or more of the EEA EFTA States intend to participate have been incorporated into the EEA Agreement. 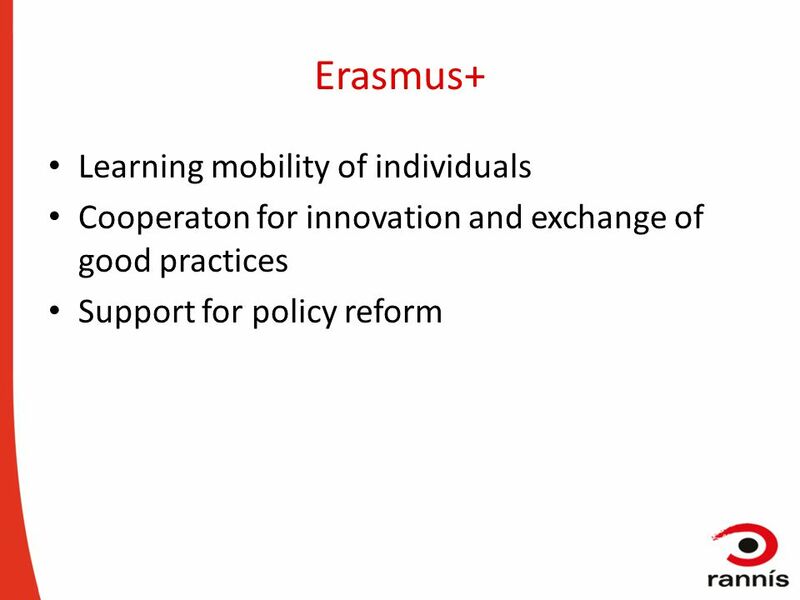 – Horizon 2020, – Erasmus+ and – Creative Europe Four programmes are scheduled to be adopted on the EEA Joint Committee meeting on 27 June 2014 Employment and Social Innovation, Civil Protection Mechanism, COSME Statistical Programme Two more programmes are planned to be adopted at the EEA Joint Committee meeting on 9 July 2014 Connecting Europe Facility (ICT-part) Rights, Equality and Citizenship Programme The EU side has informed the EFTA Secretariat that the four remaining programmes; the Consumer Programme, the Health Programme, Galileo and Copernicus will not be adopted by Council in time for the EEA Joint Committee meeting on 9 July 2014 but that they are looking into ways to ensure EEA EFTA participation as of 2014. 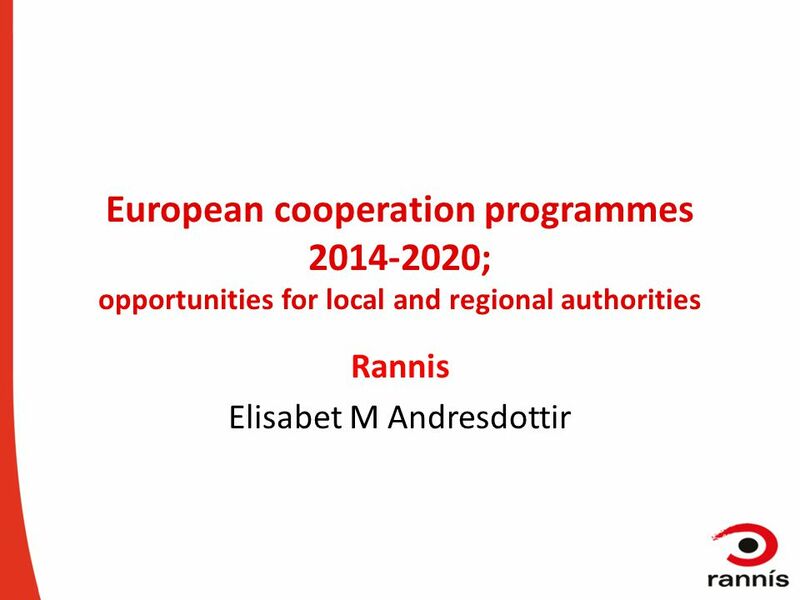 Download ppt "European cooperation programmes 2014-2020; opportunities for local and regional authorities Rannis Elisabet M Andresdottir." 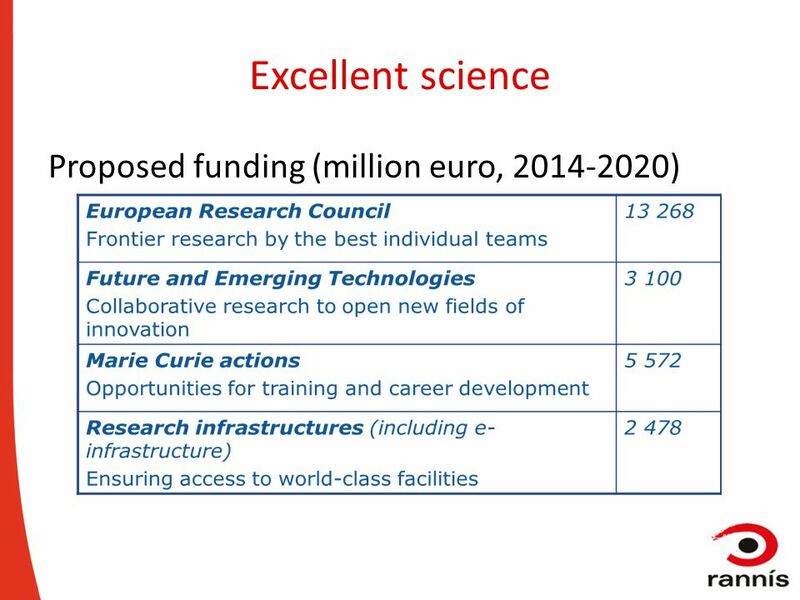 Green Paper Towards a Common Strategic Framework for EU Research and Innovation Funding dr. András Siegler Director DG Research & Innovation. 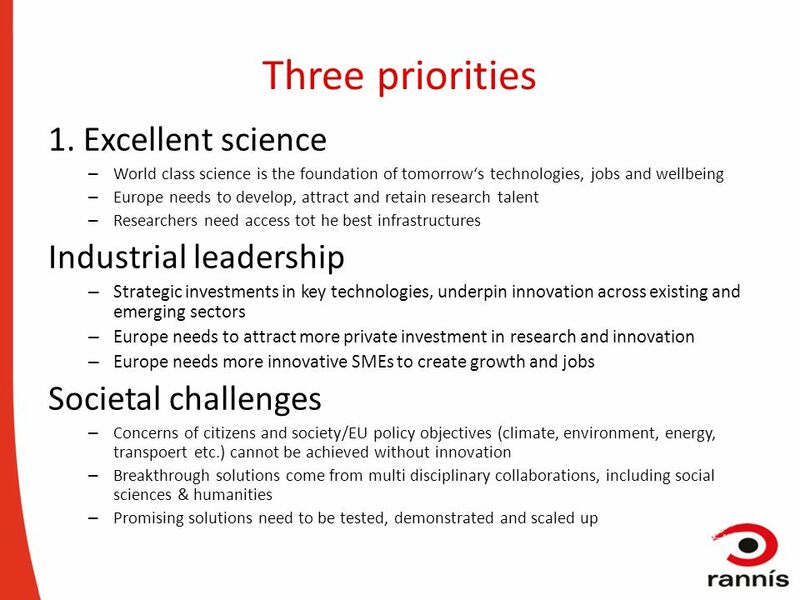 H2020 – WP 2014/15 Part 3 Marie Skłodowska-Curie Actions Education and Culture. 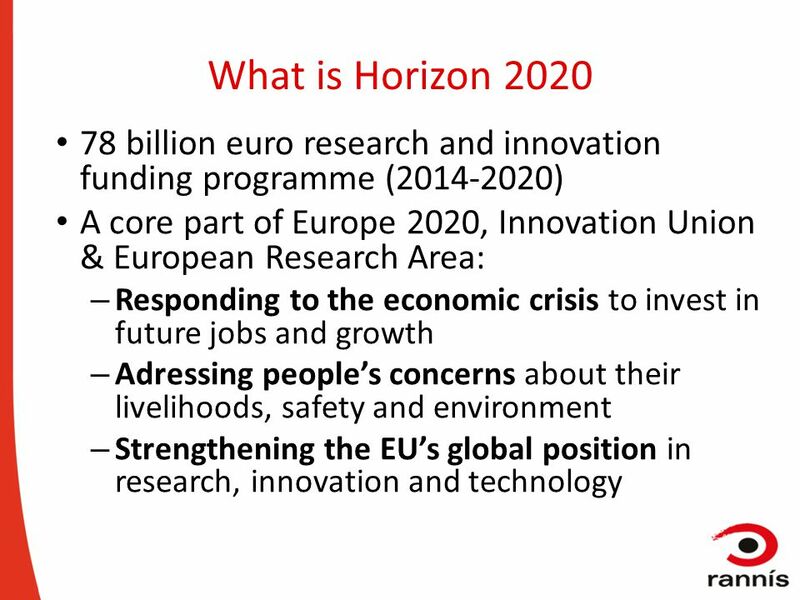 Research and Innovation Research and Innovation Research and Innovation Research and Innovation Research Infrastructures and Horizon 2020 The EU Framework. 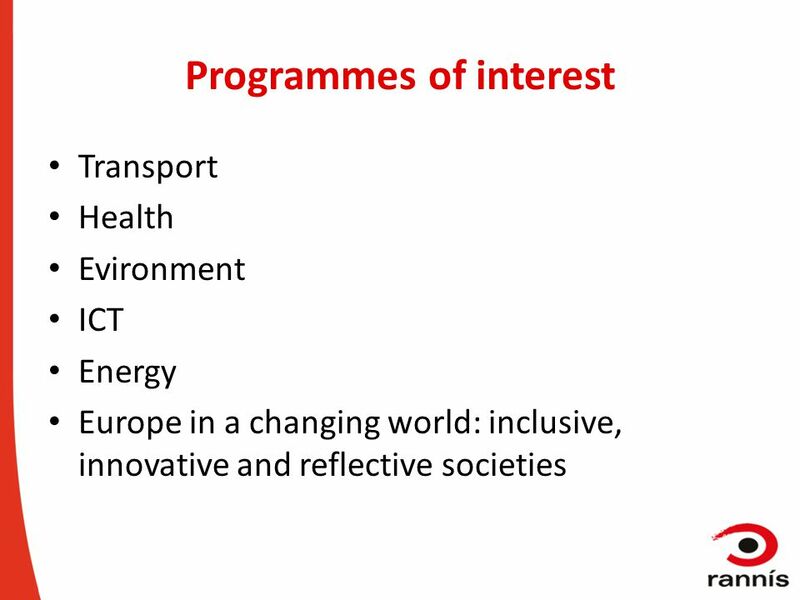 Theme heading insert HORIZON 2020 (H2020) THE NEW EUROPEAN UNION FRAMEWORK Mrs Mamohloding Tlhagale Director: Strategic Partnerships Department of Science. 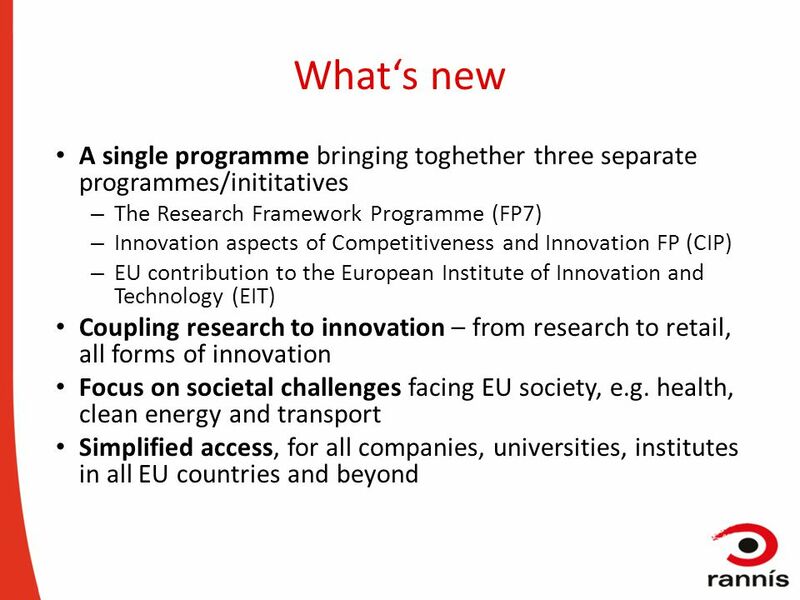 HORIZON 2020 Sandra Almeida Horizon 2020 policy DG Research and Innovation.